Craig Stadler has won numerous tournaments at both the PGA Tour and Champions Tour level. Stadler won his first two PGA Tour events in 1980, at the Bob Hope Desert Classic and the Greater Greensboro Open. His career year was 1982 when he won four PGA Tour events including The Masters. Stadler won the B.C. Open in 2003, becoming the first player over age 50 to win a PGA Tour event in 28 years. He won 13 PGA Tour events in all, and played on the 1983 and 1985 Ryder Cup teams. 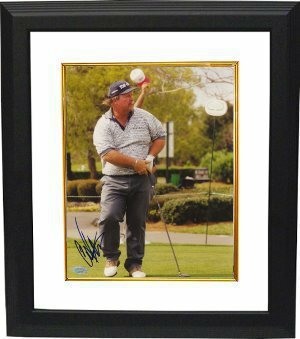 Craig Stadler has hand autographed this 8x10 Color Photo. Mounted Memories Hologram and Certificate of Authenticity. Custom White Mat and Black Color Framed as shown.